Likable Terence Hill and stocky Bud Spencer team up again as the valiant duo . The agreeable crew makes a new adventure movie plenty of fist-play , action and entertainment . This amusing film deal with ours intimate friends in South America , they’re nowadays two pilots , the blue-eyes and sympathetic Terence Hill as Plata and a grumpy and goofy Bud Spencer as Salud ; as they are hired for crashing a plane for insurance money . They wind up ditching for real in the jungles of Amazon . The argument involves “Mr. Big”, Reinhard Kolldehoff , who is buying the precious stones from the miners for much too little, and has nasties who keep the price down. Of course, they will combat thieves ,thugs and criminals . The ‘big time’ duo of Spaghetti Western with humor such as ¨They call me Trinity¨, ¨ Trinity is still my name ¨ and sequels as ¨Troublemakers¨ were run out and for that reason are transfered in modern era film , playing the police/action genre and adventures as ¨All the way boys¨ also titled ¨Plane crazy¨ . After that , they starred the successful ¨ Miami police series ¨, which belong the following : ¨Crime Busters¨ , ¨Superfuzz¨ and ¨supercops in Miami¨. 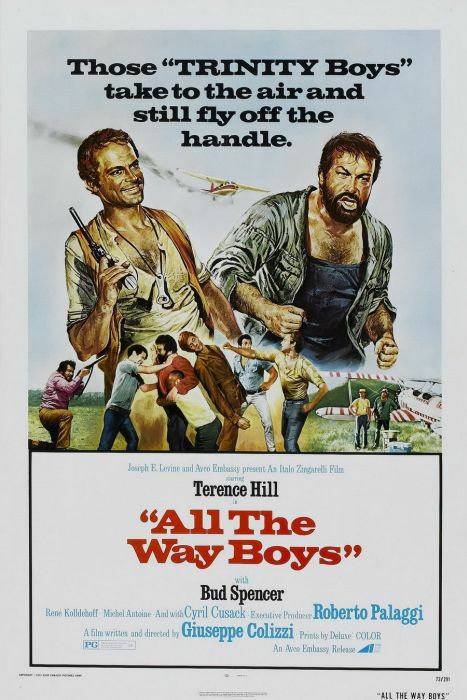 The movie contains silly comedy , the usual slight figts and a little bit action including some car pursuits when Bud Spencer robs a police vehicle and is pursued by others .The humor is based on physical and personality differences of the starring , as Terence Hill is the sympathetic and brave hero and Bud Spencer is the corpulent and hunk man. As always several humorous struggles with no blood , neither violence . Enjoyable performance of Cyril Cusack , a veteran British with a long and prestigious career ; furthermore Riccardo Pizzuti ,habitual secondary in Hill-Spencer films . Mediocre cinematography and commercial musical score by the usual Guido and Maurizio De Angelis , including catching songs . The motion picture is regularly directed by Giuseppe Colizzi . Giuseppe directed a trilogy starred by Hill and Spencer as Cat Stevens and Hutch Bessy respectively. The first and superior and the best outing was ¨Dio Perdona..¨; the second installment is ¨Four gunmen of Ave Maria or Ace high ¨ with the great Elli Wallach and more camp tendencies ; and the third is ¨Boot Hill¨ with Woody Strode . Colizzi subsequently realized another buddy movie ¨Joe and Margherito¨ with Keith Carradine and Tom Skerrit until his early death at fifty years old . The flick will appeal to famous pair fans.